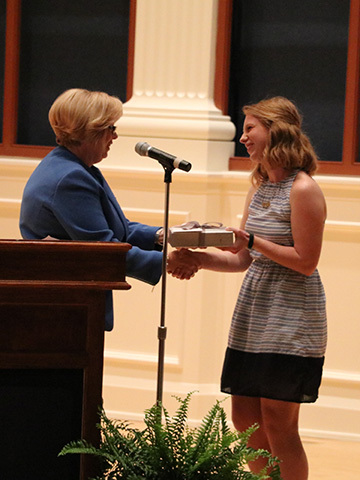 Samford University’s Ida Moffett School of Nursing held its annual spring award ceremony April 20. The ceremony recognized the accomplishments of the school’s undergraduate students in both the traditional and accelerated Bachelor of Science in Nursing programs. Amy Allen, president and chief executive officer of Baptist Health System, presented this year’s Baptist Health System Awards and the Baptist Health Foundation Awards. The Academic Achievement Award is awarded to the senior nursing student with the highest GPA in the graduating class. This year, Anna Maddox, a senior from Warner Robins, Georgia, received the award for the traditional B.S.N. program, and Ashley Hopkins, a senior from Vestavia Hills, Alabama, received it for the accelerated second-degree B.S.N. program. The Ida V. Moffett Caring Award recognizes a student of high ethical value with an ability to serve a patient’s invisible and visible needs. This year’s recipient was Madison Thomas, a senior from Savannah, Georgia. Baptist Health Foundation Award recipients included the Lucy Jarrell Estes Memorial Scholarship Award to Emma Kate Batch, a junior from Acworth, Georgia; the Marion A. Marx Nursing Scholarship Award to Rachel Thompson, a junior from Peachtree City, Georgia; and the Ida V. Moffett Memorial Scholarship Awards to Dara Bessinger, a junior from Benbrook, Texas, traditional B.S.N., and Julia Adams, a senior from Mountain Brook, Alabama, accelerated second-degree B.S.N. Along with the student awards, professor and Samford’s emergency readiness coordinator Cindy Berry was recognized with this year’s Outstanding Faculty Award. Additional awards included Student Life Award to Julie Zaharis, assistant professor; Christian Leadership Award to Sophie Lassonde, a junior from Surfside, Florida; and Lucille Stewart Beeson Nursing Award to Katie Fowler, a senior from Charlotte, North Carolina. Olivia Odom is a journalism and mass communication major and a news and feature writer in the Division of Marketing and Communication.